There's no shortage of advice out there about how hospitals can speed up reimbursement from payers. Entire publications and websites are dedicated to best practices for the revenue cycle, from how to train staff to submit more claims to how to better manage multiple payer contracts. What's noticeably absent from these suggestions are tools to address the most time-consuming job of all: claims status follow-up. Hospitals already understand the importance of submitting clean claims. They've made good use of best practices and software designed to review and edit claims prior to submission. But even with providers' best efforts, more than 5% of claims (representing millions of dollars to the average hospital) will not be paid or applied to patient responsibility on the first pass. Furthermore, payers vary in the time they take—anywhere from 14 to 60 days—to resolve troublesome claims. Payers' use of autoadjudication has helped but not solved the problem. According to data from America's Health Insurance Plans, the overall rate of autoadjudication by payers is well below 80%, meaning many claims still require time-consuming manual intervention. To help speed payment, the best-performing hospital back offices have their teams identify and remediate the highest-risk claims. Work queues, which are built and managed around team members' expertise, focus on the highest dollars. The challenge becomes quickly determining which claims need the attention of the hospital's limited resources. That's a tall order. The average hospital processes tens of thousands of claims per month. And since there's no way to know ahead of time which claims will go through smoothly and which will require further work, staff members spend their days logging onto individual payer websites or calling payers to see whether claim status data have been posted. Even the largest integrated delivery networks are challenged to hire enough professionals to scale this highly manual process into a comprehensive and timely claim status program. Moreover, the demands of claims status follow-up mean that claims specialists are frequently pulled away from higher value tasks such as remediation to check on claims status. That's a poor use of resources, considering that follow-up can take up to 15 minutes per claim. • Awaiting a Payer Response to Take Action. To keep claims active and maximize the likelihood that they will be paid in full, insight into their status is needed well before 30 days. Every provider recognizes there is a direct correlation between the age of an account and the difficulty associated with adjudicating the claim. In short, waiting for the payer to provide this information is not in the provider's best interests. Additionally, even if the payer was to send a notice of denial within 30 days, the reason is often unclear, further delaying the opportunity for the claim to be paid. • Boosting Staff. The chief problem with assigning additional staff to continuously call payers to check statuses is that there's no way of determining whether these valuable resources are pursuing claims that already have been approved. It's not uncommon for employees to spend more than one-half their time following up on approved claims—a poor use of back office staff who could be focused on remediating problem accounts. • Outsourcing. Throwing additional manpower at the problem may lessen the burden on in-house resources, but it doesn't eliminate costly follow-up on claims that are slated for payment. This option leaves providers paying a third party to perform a blanket chase of all claims rather than focusing only on the exceptions. Outsourcing can be cost-effective only if the third party has exclusive access to payer data that could streamline the process. • Reliance on EDI 277 Claims Status Transactions. The creation of electronic information exchanges between providers and payers was intended to vastly speed up communications about claims status and other issues. When providers send an inquiry about a claims status (referred to as a 276 transaction) the response is called a 277 transaction. However, the 277 response typically does not explain the reason for denial, only whether it was denied or approved. This means the process of getting paid is still far from over. In search of a better solution, many hospital business offices are turning away from manual and outsourced claims status follow-up. Instead, they're beginning to leverage business process automation tools to obtain claims status. 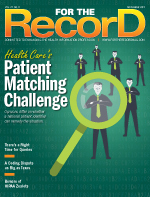 Borrowing a strategy called exception-based workflow from other industries, this new approach leverages automated "Web bots" that can query and retrieve detailed claim status data from payer websites weeks before the provider would otherwise receive it. Returned information can be automatically standardized and populated into the provider's claims workflow system. The beauty of the new automated processes is that they effectively remove approved claims from back office work queues, instantly eliminating the need to follow up on the vast majority of claims. That itself marks a significant leap in productivity. But automation goes further by simplifying the process of correcting denied claims in preparation for resubmission. That's because the Web bots that scour payer websites for claims data return a detailed explanation of the denial reason rather than the vague or generic response received from an electronic data interchange, which requires additional research or follow-up with the payers. To further streamline the process, claims marked for denial are routed to the appropriate work list, which can be customized according to each facility's workflow. This feature allows providers to assign staff members who have skills in a specific area to work only on the claims they have experience handling. By enabling the best use of staff expertise, the entire process is made more efficient. Automating claims status follow-up has the potential to transform hospital business offices far more quickly and visibly than a theoretical manual best practice can achieve. Of course, that's not to say that best practices don't have their place. They do, and they will continue to add value for providers. But forward-looking health care organizations are making sure these practices—and their employees—are supported by automated tools and technologies that can take them to the next level. — Jay Deady, an HIT leader, product visionary, and innovator for more than 25 years, is CEO of Recondo, a revenue cycle services company.